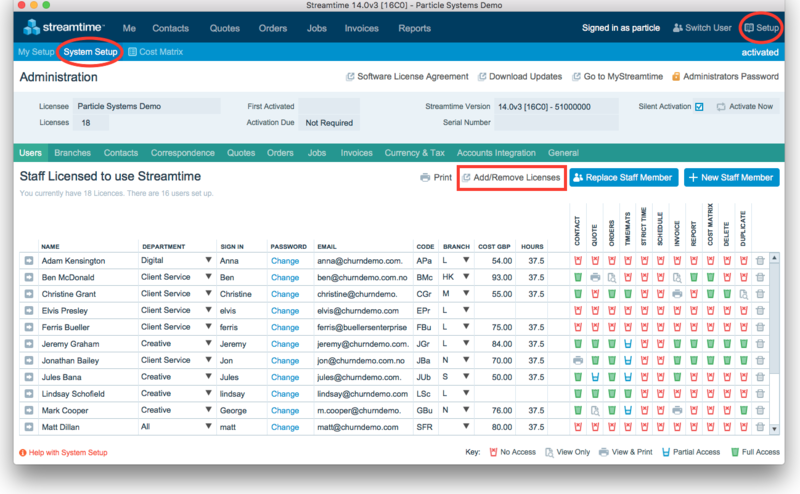 Add/Remove, Delete, Add New Staff, Replace Staff, Manage Staff data. 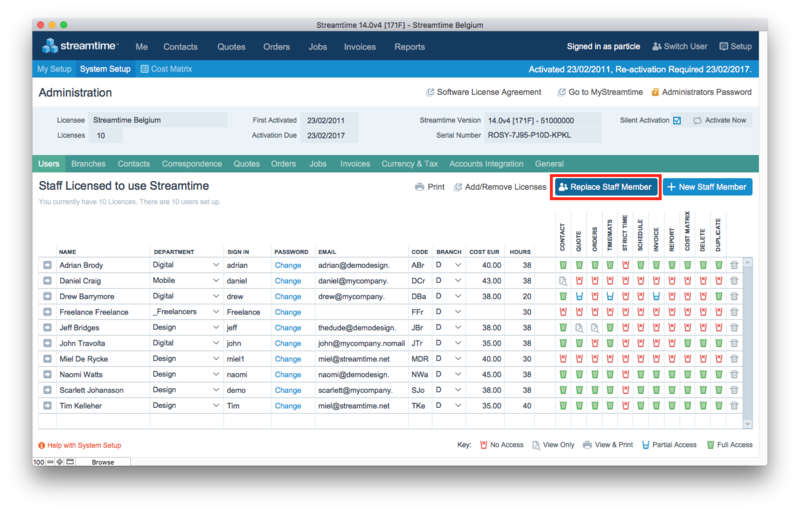 To increase or decrease you Licence count, log into your MyStreamtime admin portal; everything you need to know about this can be found in here. 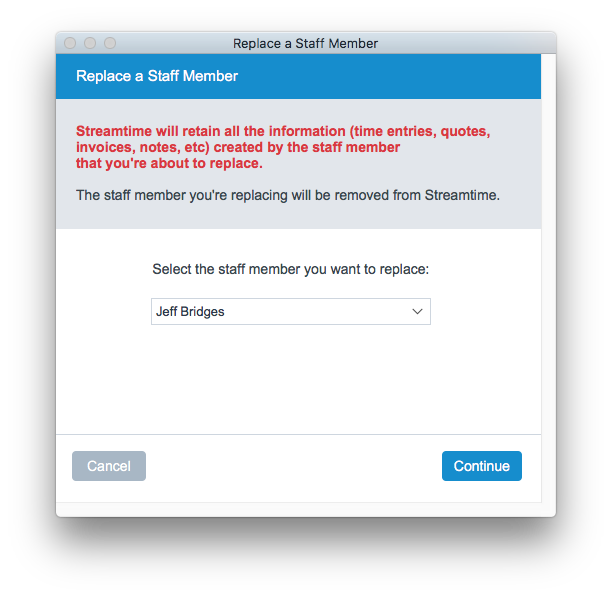 If a Staff Member has left and you want to delete them, it's perfectly safe to do so; when a staff member is deleted from Streamtime, all information (time entries, notes etc) for that staff member will stay in the system. Once click on the trash to delete a User, a pop up will confirm which user you are deleting; if the information is correct click OK. The final step is to ensure that you remove Filemaker Pro from that person's computer; you can do this by simply moving the application to the Trash. 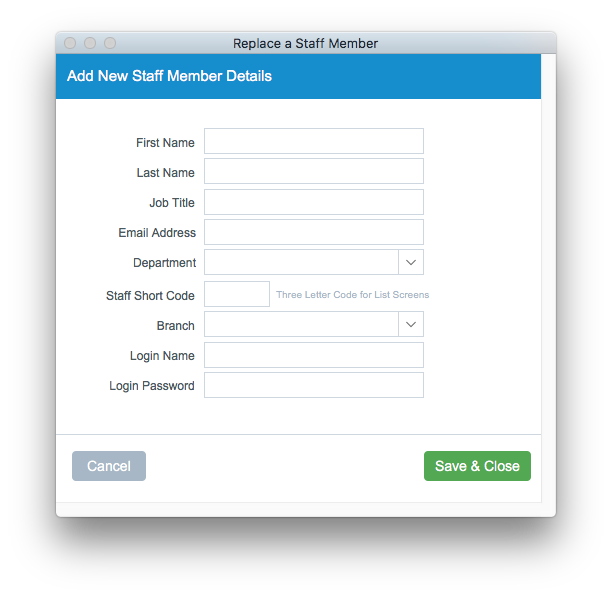 To create a new User click on '+ New Staff Member' and fill in their details, remembering to note the Staff Short Code, Login Name and Password that you've created. If you see a message advising you don't have enough Licences, see Point 1 above. Note: Streamtime passwords are case sensitive. Select the Staff Member who you want to remove and delete them. Then add the New Staff Member's details. If the 'old' Staff Member had incomplete tasks outstanding, you will be asked if you want to assign them to the New Staff Member; in this example, Lindsay had 3 incomplete tasks, all of which I'd like to re-assign to Elvis. You'll then be notified that Lindsay has been successfully replaced by Elvis. And when you view the Task List for Elvis, you'll see Lindsay's incomplete tasks have been assigned to him. If a Staff Member leaves your organisation and is replaced by someone new, the standard practice is to delete the 'old' User and create a 'new' User. It is also possible to transfer all the data associated to the ‘old’ Staff Member to a new User; to associate the tasks & time entries to the new account, please follow these steps. A cost rate for that Staff Member; this is the hourly rate that Staff Member costs you, not the charge your rate. No Access - user has no access to that area of Streamtime. View Only - user can see the area but can make no changes. View & Print - is the same View Only but also allows the user to print as well. Partial Access - means that "cost" prices are switched off so the user will only see sell rates; Partial Access only applies to can View/Create Quotations, can Modify Time & Materials and can Invoice Jobs. Full Access - means the user has full access to that area of Streamtime.